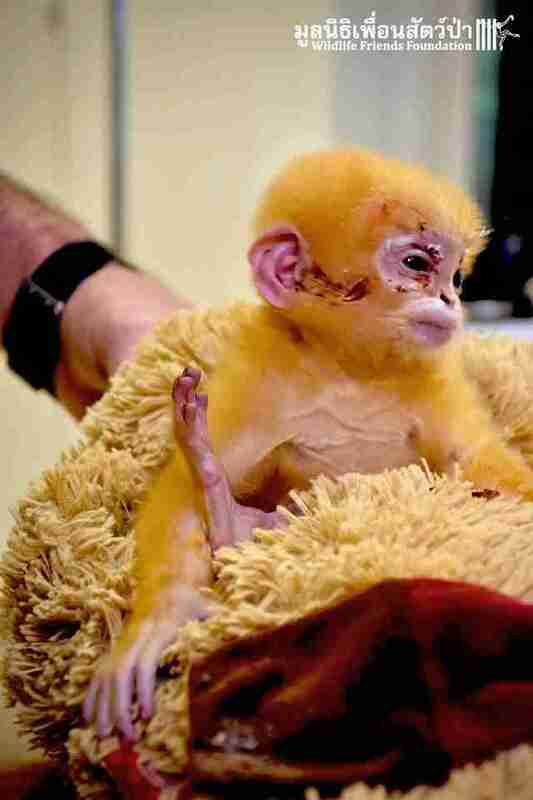 Scared and alone, the baby langur monkey likely wouldn’t have survived if people hadn't noticed him. His mom had been attacked and killed by a pack of feral dogs and, at only 1 week old, the baby miraculously survived — but he was injured with no one to turn to. 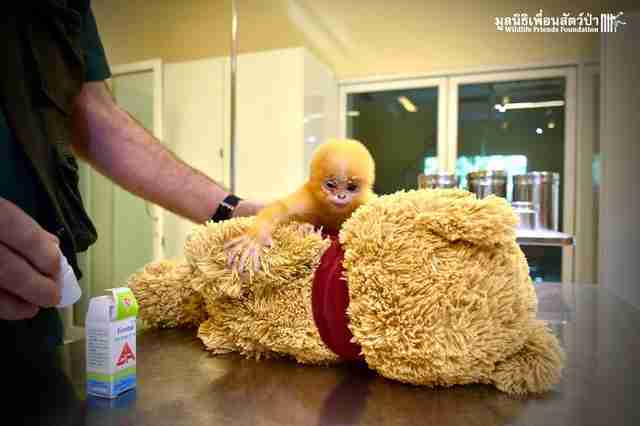 The people who found him contacted Wildlife Friends Foundation Thailand (WFFT) right away to respond to the emergency, which sent rescuers out on a four-hour drive to pick up the weak monkey. 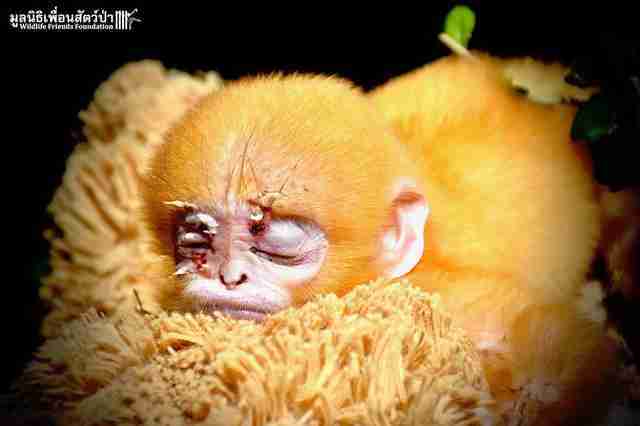 They later named the young orphan Kanoon. Since his mom was gone, it was clear to rescuers that he needed someone else to keep him company in the new, scary place. They decided to give him a big, fluffy teddy bear — and he’s quickly taken to the bear as the closest thing to family. “He has taken a particular liking to [it] for comfort,” rescuers said on Facebook. In photos, he snuggles up to it and grasps its yellow plush fur with his tiny hands. 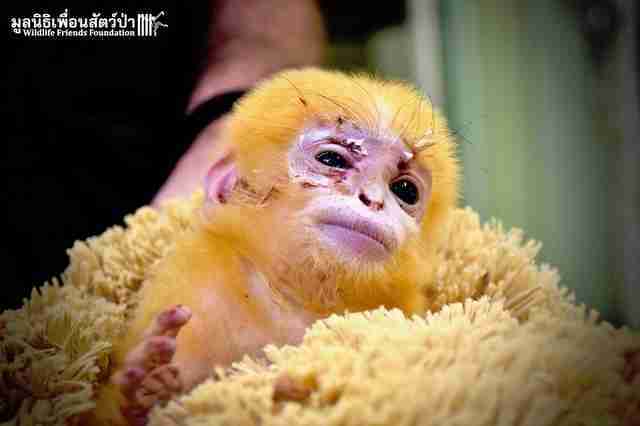 Its yellow fur almost blends in with his own. Like any baby would, Kanoon even naps with his teddy and makes sure to hold it tight while he gets some rest. The bear is something that, in addition to special care from the vet team, will soothe Kanoon and help him avoid feelings of distress or isolation. 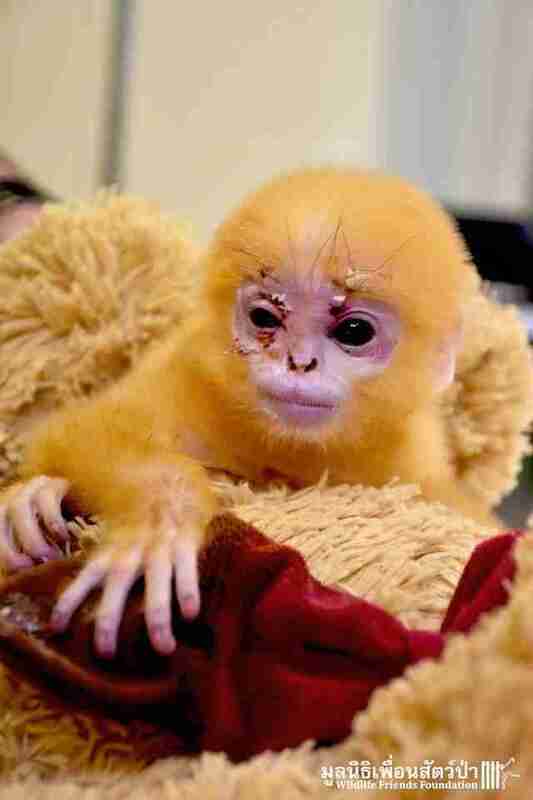 As youngsters in the wild, langurs typically live alongside their mothers for at least the first 13 to 20 months of life — so being without Mom after only a week can pose challenges. 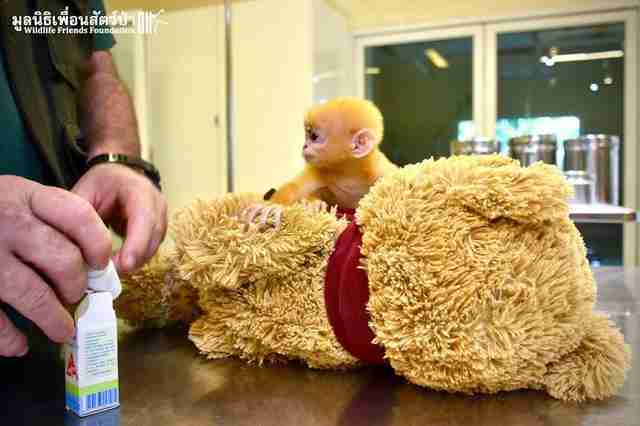 But luckily, for now, Kanoon is comforted while he receives treatment for his injuries. 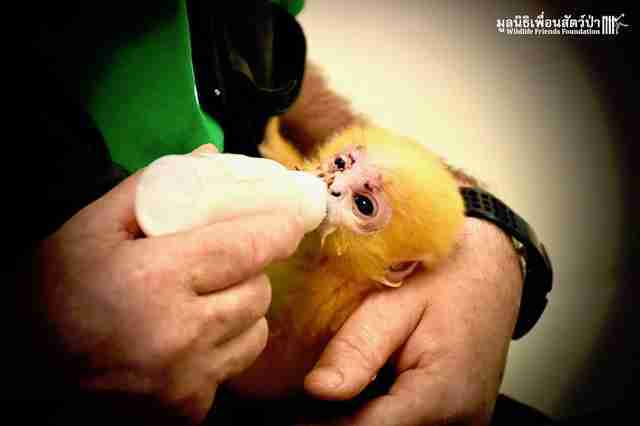 As a species classified as near threatened by the IUCN Red List, rescue teams like WFFT take every opportunity to nurse injured langurs back to health. They’re often hunted for food or poached from the wild to be sold as pets, WFFT said, which is causing a clear decline in populations — and makes it all the more admirable that the people who found him contacted rescuers first. While it’s still unclear whether Kanoon will be releasable once he recovers, WFFT provides a safe home for animals in need at all stages of life. Until then, Kanoon will continue to be treated — and will have his special friend by his side each step of the way. 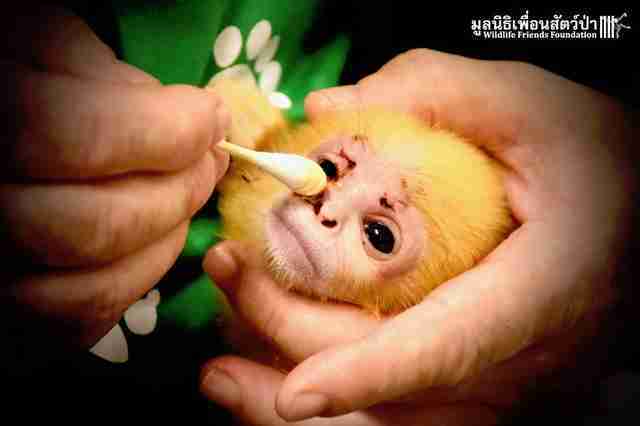 For updates on Kanoon's rehabilitation, you can follow Wildlife Friends Foundation on Facebook.